The evening of 13 February 2018 was very clear. I used the WATEC video camera to track objects in Low Earth Orbit in evening twilight, and later in the evening did a short session on Geostationary satellites. 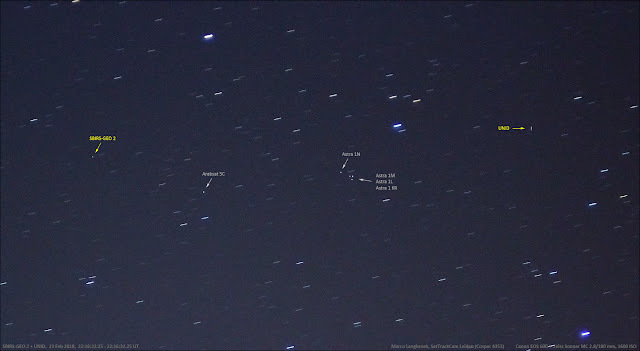 Over the course of this I recorded as much as 3 initially unidentified objects ("UNID's"): objects that at the time of observation did not match with a known orbit in either the unclassified JSpOC orbit database or our amateur database of classified objects. The first of these UNID's was the one in the footage above, which appeared while I was waiting for another satellite to pass. It didn't match anything known. 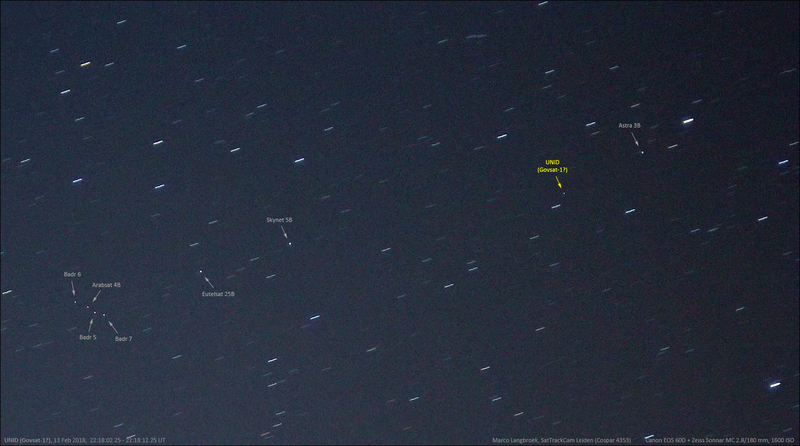 The ~62-degree orbital inclination from a circular fit to the data suggested something NOSS-ey. 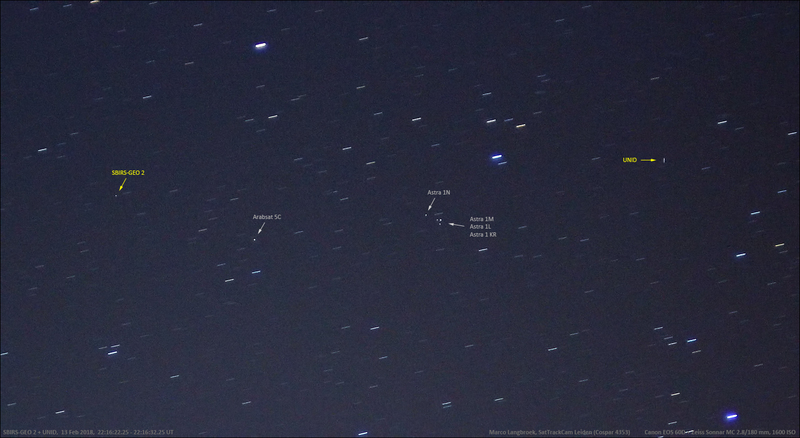 Mike McCants later managed to identify it as probably NOSS 6 (C), (1984-012C), last observed 10 months ago. 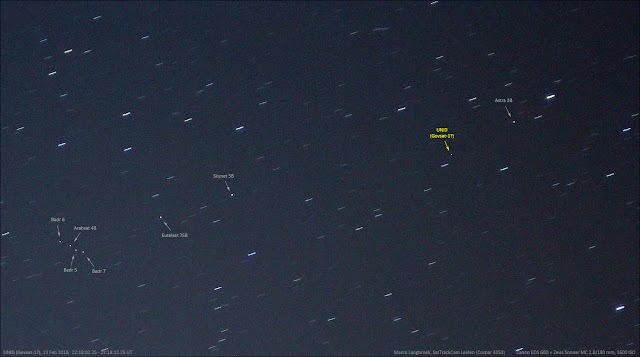 This turned out to be the same object as a UNID imaged by Cees Bassa that same evening, and correlated by him to the object we designate as "Unknown 091017" (2009-790A). This object was first seen in 2009 and more recently "lost" for a while, as it was last seen 566 days (1.5 years) ago. 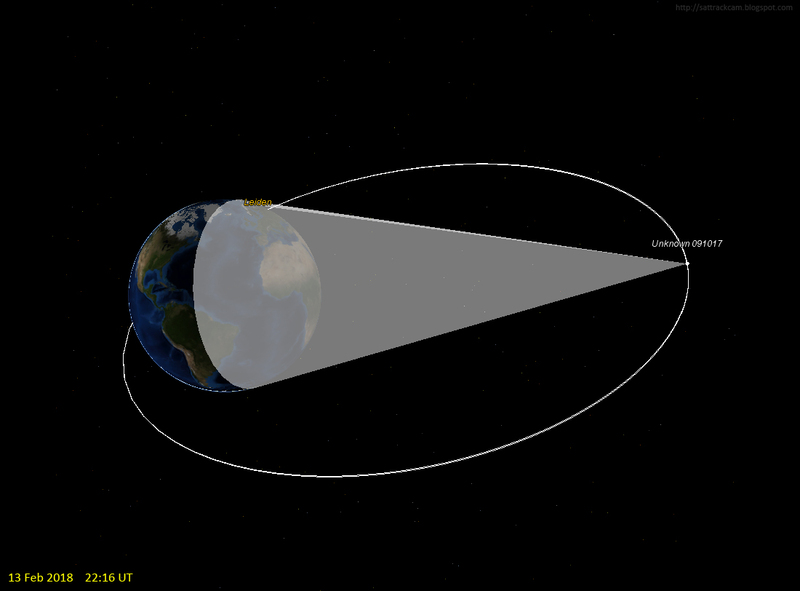 This object in a 25 degree inclined GTO orbit (image below) is probably a rocket stage from a classified launch. I initially somehow managed to miss this object when going through my imagery, but Cees Bassa had imaged it that same evening and urged me to look for it in my imagery, after which I found it too. This object is most likely Govsat-1 (SES 16; 2018-013A), launched for a joint-venture of SES and the Luxemburg government by SpaceX two weeks earlier on 31 January 2018. 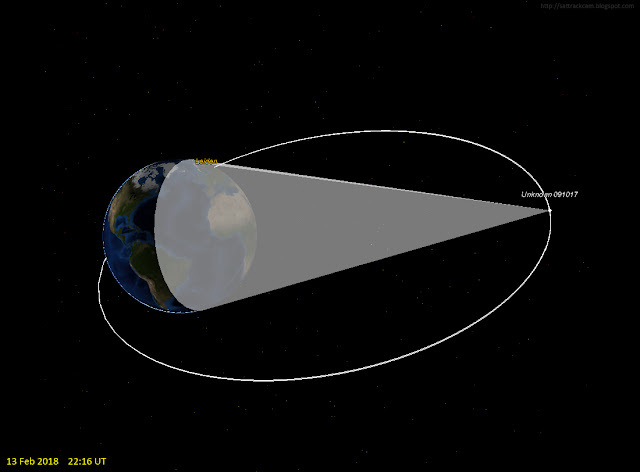 It is "aimed exclusively at government and defence users" and its orbit is classified (although its operational slot at 21.5 E has been made public). The military of several NATO countries will use it for secure communications as part of military and humanitarian operations. The satellite was built by Orbital ATK. The orbital slot assigned to it is at 21.5 E. On the evening of 13 February we detected it at 23.8 E, some 2 degrees to the East of this, so it probably is still slowly drifting westwards towards 21.5 E, where it will arrive somewhere in the coming few days. The object had a noted brightness variability (in the image above it was at its brightest, while it was completely invisible in some of the other images), indicating it is spinning, probably spin-stabilization while in transfer to its orbital destination. This object will be very interesting to follow in the feature, as it has a port that allows another still to be launched object to dock to it.